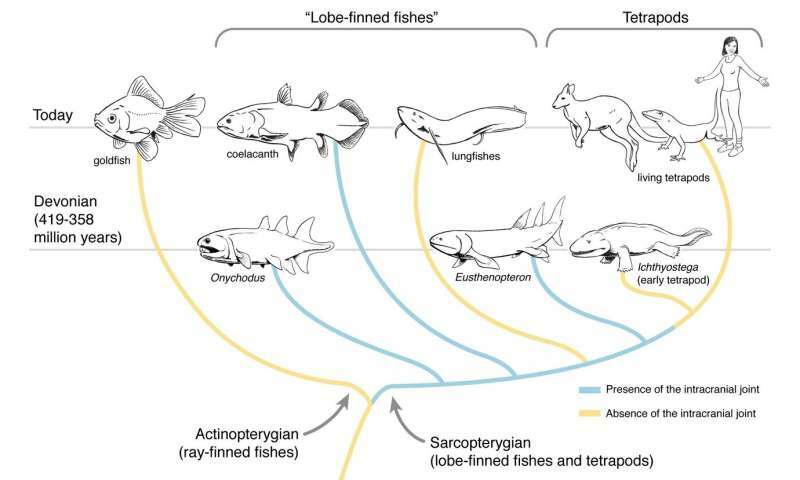 New research into one of the oldest species of fish in the world, Coelacanth, provides fresh insight into the development of the skull and brain of vertebrates and the evolution of fins and terrestrial animals, as published in Nature. Coelacanth (Chalumnae Latimeria) is so rare that it was thought to have perished with dinosaurs over 65 million years ago. However, the discovery of a live specimen off the coast of South Africa in 1938 sparked a debate about whether this fish suits our understanding of the evolution of terrestrial animals. The skull of this fish is also completely divided in half by a special "intracranial joint", and its brain is so ridiculously small that it remains only one percent of the size of the cavity it is in, which makes Coelacanth survival unique among all living vertebrates. A new publication by an international team of scientists provides information on the biology of the unique skull of this fish and its links to the evolution of vertebrate species, including humans. As the coelacanth skull grows and why the brain remains so small, it remains a mystery for thousands of years, but a team of scientists, led by Dr. Hugo Dutel of the University of Bristol, studied his brain cavity at various stages of development to understand when the skull is divided into a hinged casing the brain. 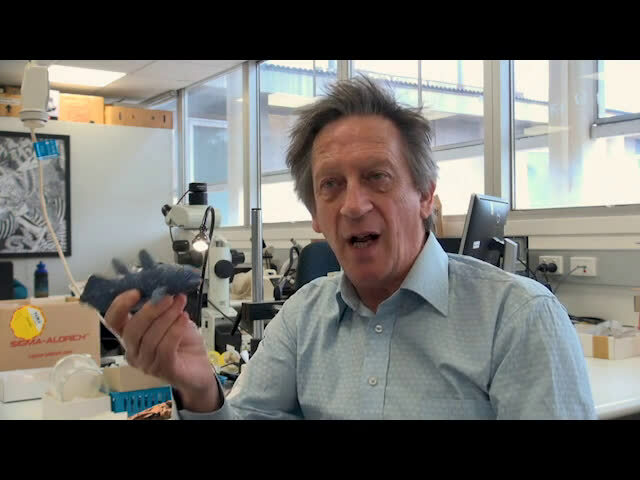 Associate Professor John Long of Flinders University says the discovery helps to better understand why ancient fossil fish had hinged heads and suggests why four stripped animals later lost this connection between the two parts of the skull. "We believe that the formation of this special joint is probably due to the unique development of the dorsal string (the tube extending below the brain and the spinal cord in the early stages of life). "In some fish, it usually degenerates into a small rod below the brain. 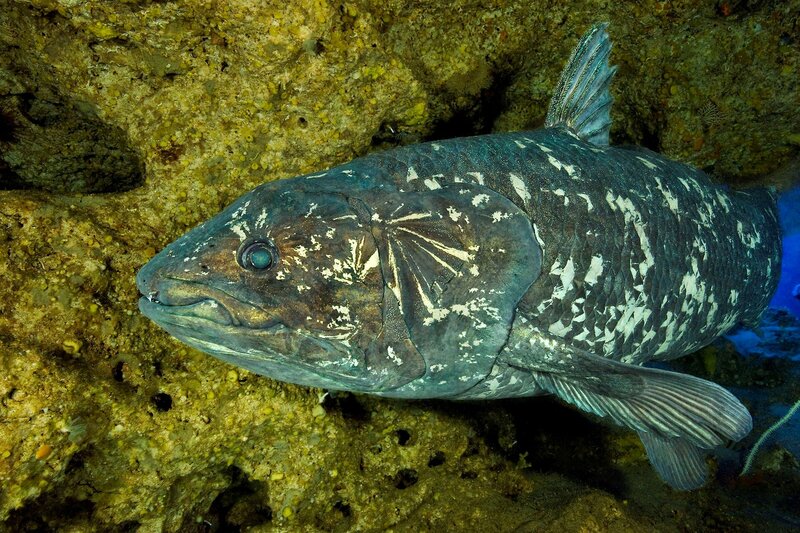 However, the Coelacanth's string is dramatically growing to become 50 times larger than the brain of an adult fish. " "This brain growth process is very unusual, especially when compared to primates, such as us, in which the brain is rapidly expanding. The mismatch between the brain and its cave also exists in some other living and fossil fish, but what is observed here is completely unrivaled among vertebrates. " Two species of primitive, slowly moving coelacanths are often called "living fossils" because they remain physically unchanged. Researchers used state-of-the-art imaging techniques to visualize the internal anatomy of fish without damaging them. Digitized a fetus with a length of 5 cm, the earliest available development stage, with an X-ray synchrotron at the European Synchrotron (ESRF). Genealogical tree of vertebrates. Credit: Hugo Dutel, University of Bristol. A general anterolateral view of the fetus of the Coelacanth fetus. The brain is yellow. Source: Dutel et al. 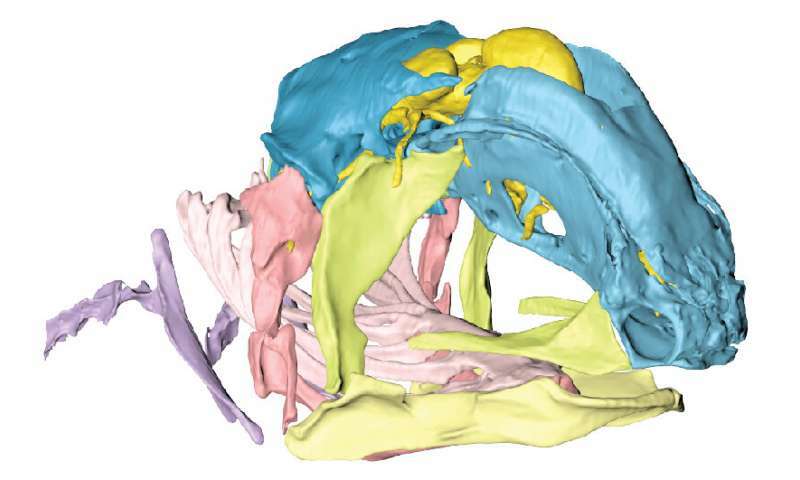 The data was used to generate detailed three-dimensional models, which allowed the team to analyze how the form of the skull, brain and dorsal cord changes from fetus to adult. 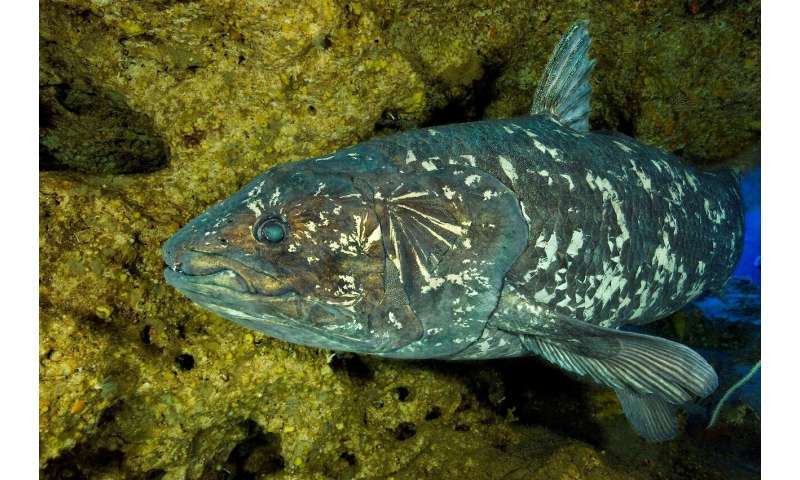 "Coelacanthas are iconic animals that are supposed to be on the line to the first land animals or tetrapods, because of their strange hinged head," says Professor Long. "These new studies show that the quaint hinge in the skull was caused by the maintenance of a large cartilage or dorsal string, preventing skull ossification as one fixed unit." The team also observed how these structures are distributed to each other at each stage and compared their observations with what is known about skull formation in other vertebrates. Dr Hutel says that these are very unique observations, but they are only a small step forward compared to the amount we know from the development of other species. "There are still more questions than answers! Latimeria still has many tips for our understanding of the evolution of vertebrates and it is important to protect this endangered species and its environment. " the part may be reproduced without written permission. This content is for informational purposes only.